If you’re looking for a good Christmas or birthday gift for someone in your family that loves Legos, I can help. As a Lego fanatic, I’m constantly waiting for new sets to become available. Below, I’ll give you some insight into some of the best new Lego sets as well as other good Lego gifts and accessories out there right now. 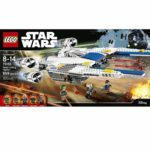 With the Force Awakens release last December and the Rogue One release date of December 16 of 2016, Star Wars Legos are more popular than ever. 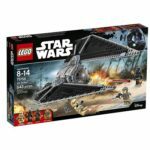 There are Lego sets available for each movie as well as for the extremely popular Disney series, Star Wars Rebels. Here are a few of the Star Wars Lego sets that really stuck out to me as must-haves for any Lego lovers this year. The Lego advent calendar is a must-have for every Lego lover at Christmas time. This year’s is Star Wars themed and, like most years, will likely sell out early. The Advent Calendar is always one of the most popular Lego gifts of the Christmas season. Now that it’s Star Wars themed, it’s sure to be even more so. 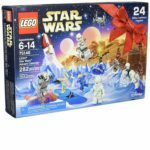 Your Lego lover gets to open 24 different Lego Star Wars themed Legos before Christmas. The other cool thing about the Advent Calendar is that you get a lot of customized pieces. 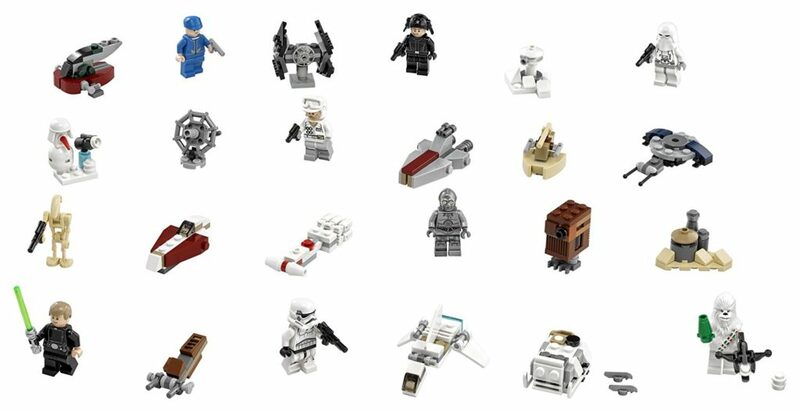 These include 10 different vehicles, listed in the table below, 8 mini figures, a battle droid, Luke’s lightsaber, 2 blaster pistols, 3 blasters, and a snow caster. Overall this set might seem expensive at around $40 when you’re only getting the 24 gifts (282 pieces), but these types of pieces are typically much more expensive than your normal bricks and actually a pretty good value. These are likely to sell out, as they always do, so get it while you still can. Here are a few sets for Rogue One with a release of September 30th. I put this set first as it’s the one I’m most excited to put together. Lego does a great job of putting these together to look like the real thing and the guns and the 4 big engines really make this thing look awesome. The Lego Star Wars Rebel U-Wing fighter features 659 pieces including 5 minifigures and front spring-loaded shooters. As you can see in the pictures this is not only going to be a fun set, it’s also going to be a collector’s set. Overall this set is rather expensive but the perfect gift for any Star Wars and Lego lover. There are a lot of custom pieces here that you’ll get nowhere else. One of the greatest parts about getting these sets before the release of the movie is the insight they give you into the movie itself. 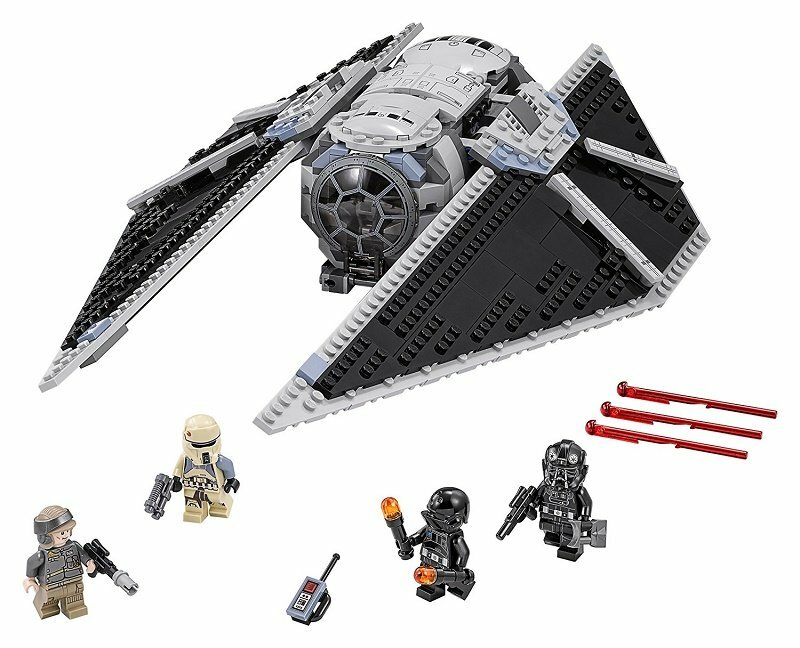 The Tie Striker set features 543 pieces including 4 minifigures, a blaster pistol, blaster rifle, and a double-barreled blaster. The Tie Striker itself features large adjustable wings, a minifigure cockpit that you have access to, and rear storage. The set is somewhat large when it’s put together with dimensions being 2″ high, 16″ long, and 9″ wide. Overall this is another exciting set from Lego and a must-have for me personally. I’ll likely keep an unopened box as an investment down the road as well. Any Star Wars set will be a premium-type block set, so the price here is certainly not unexpected as you get what you pay for. Baze looks like a man among boys with that heavy blaster. 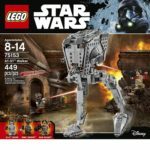 This 449 piece set features the AT-ST Walker shown in Rogue One. 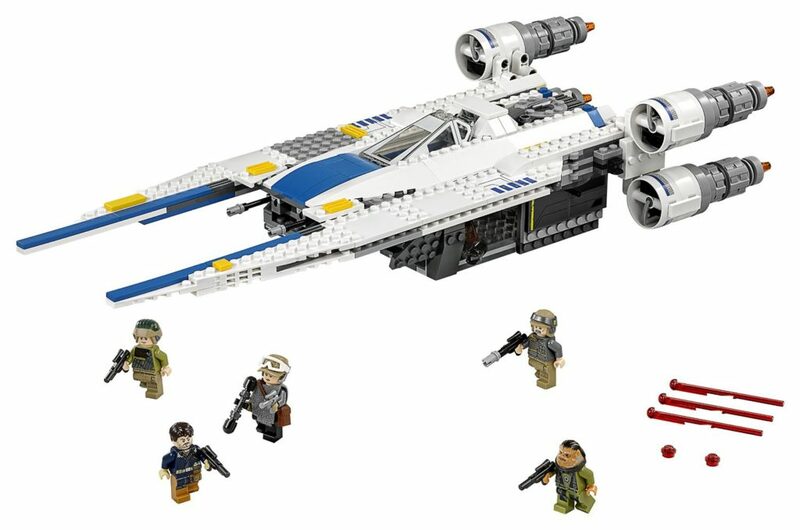 It includes 3 minifigures and one of which is Baze Malbus, poseable legs, a wheel activated top section, a cockpit which opens, and dual spring-loaded shooters. Accessories include Baze’s heavy blaster, his backpack, and a rebel trooper’s helmet. For dimensions, it measures 9″ high, 6″ long, and 5″ wide. 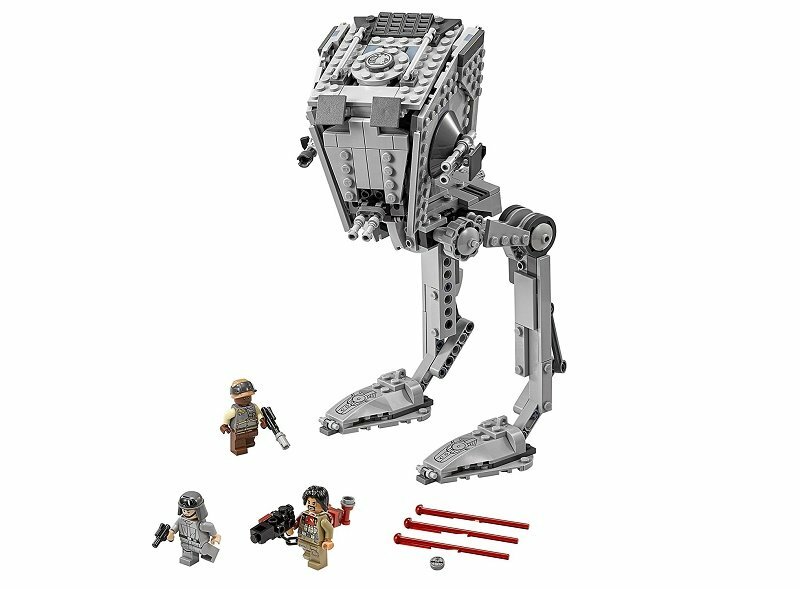 Overall, the AT-ST Walker seems like another good value from the Star Wars Lego series. Having Baze Malbus, a freelance assassin, as a part of it is really cool as well. I’m glad they included his heavy repeater cannon as this is definitely his signature weapon. Key Parts Slave I, Tie Interceptor, AAT, T-16 Skyhopper, Sleigh, Republic Cruiser, Droid GUnship, Jedi Interceptor, Skiff, Imperial Landing Craft, Battle Droid, 8 minifigures (one holiday exclusive), Luke Skywalker's light saber, 2 x blaster pistols, 3 x blasters, and a snow caster. Posable legs, wheel-activated turning top, opening cockpit and hatch, detailed interior, dual spring-loaded shooters, elevating front guns, AT-ST Driver, Baze Malbus, heavy blaster, Rebel Trooper, blaster pistol, blaster rifle, Baze's heavy blaster, Baze's backpack, and Rebel Trooper helmet. 9"x6"x5" 4 big engines, minifigure cockpit, opening side doors, pull out stud shooters, front spring-loaded shooters, rear storage hold, huge sweep-back wings, U-wing pilot, Bistan, Jyn Erso, Cassian Andor, Rebel Trooper, 3 blaster, and 2 blaster pistols. 3"x17"x7" Large Adjustable wings, minifigure cockpit, opening rear storage, dual spring-loaded shooters, TIE pilot, Imperial ground crew, Imperial Shoretrooper, rebel trooper, Endor outfit, blaster pistol, blaster rifle, and double-barreled blaster. 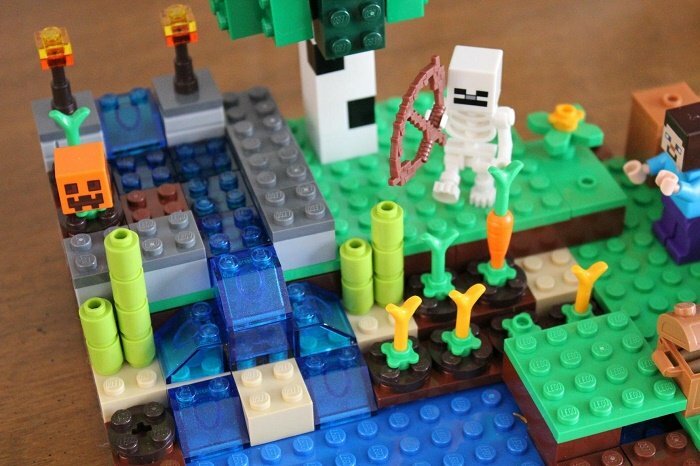 Minecraft is not only a popular video game, it’s a hugely popular Lego set series. 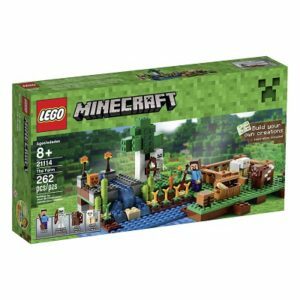 Several of the Minecraft sets are on the bestsellers list this year. Here’s a look at my favorites. 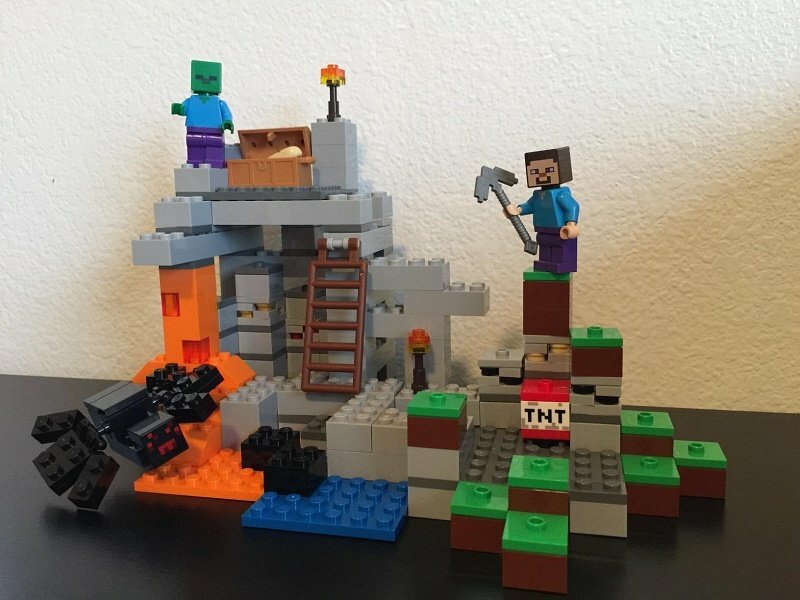 The Lego Minecraft sets may look basic to those who don’t understand the game, but kids absolutely love them. This set is not a huge one but it certainly isn’t small. With 262 Lego pieces, it’s a great price for a full set at around $17. Within the pieces, you get Steve with an accessory, a skeleton, a cow, sheep, pumpkin, 2 torches, a crafting table, a skeleton with a bow, and assorted other pieces. Dimensions for this set are 4″ high, 10″ wide, and 6″ deep. variety of sets. Again, in terms of pieces, it’s one of the better deals you’ll find. Here’s another set that’s available for a budget price of around $14. With 249 pieces including Steve, a zombie, a spider, and other assorted Minecraft pieces, it’s fun to build this as a set or add it to other sets you have. It’s not as big as some of the other sets that are available, but it adds a lot of key pieces, like the TNT box, without costing very much. Overall, this is another great price to brick ratio set. It’s best when used with other Minecraft sets as it doesn’t allow for too much creativity when placed on its own. Key Parts Steve, skeleton, cow, sheep, skeleton bow, shovel, crafting table, pumpkin helmet, 2 torches, fences, waterfall, sugar cane, premature and mature wheat, carrots, tree, and chest. Steve, zombie, spider, waterfall, lava fall, coal, iron, redstone, gold and obsidian elements, TNT, torch, and ladder. Lego City is another hugely popular Lego series. It features all kinds of sets from the city. Here are a couple of the most well-known sets. My kids absolutely love this set. 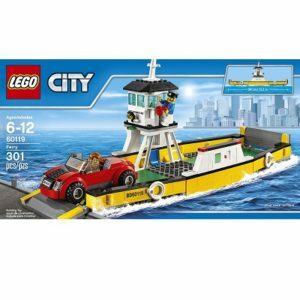 It’s the Lego City Ferry. The ferry not only looks great, it’s also easy enough for my six-year-old to put together. In addition to the ferry, you get a great looking red car, 2 minifigures, a mug, phone, and 2 fire extinguishers. The gate on the boat opens and shuts so you can load the car. 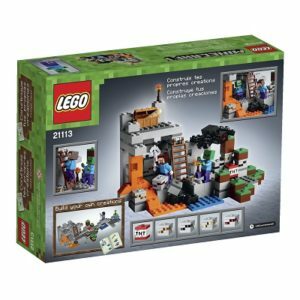 Overall, this is a great set and a decent price at around $20 for the 301 pieces. For those wondering, it does not float. This is one of my personal favorites from the Lego City series. It’s large at around 919 pieces and offers a lot in terms of classic Lego pieces. 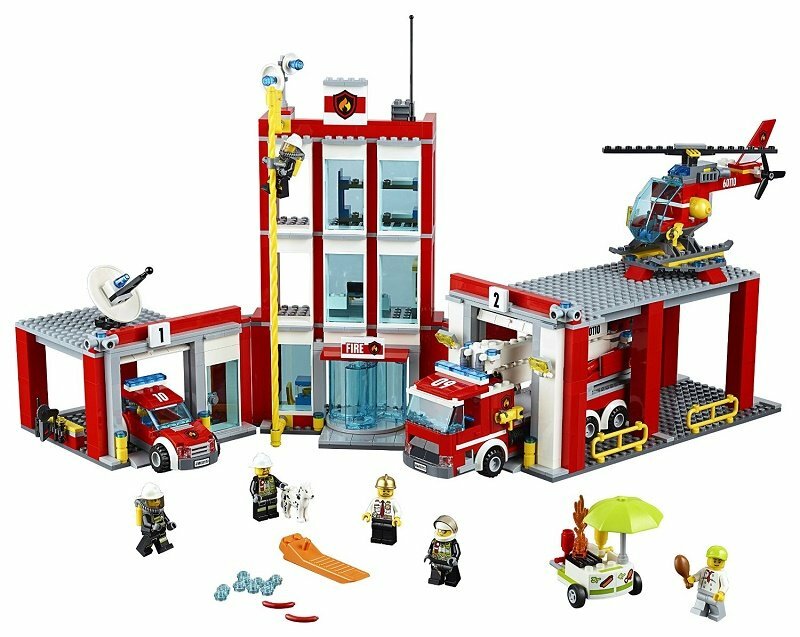 Key pieces for this set include the fire chief’s car, fire truck, cherry picker, helicopter, and a hot dog stand. The 3 sections of the build are modular and thus give you some flexibility in terms of placement. Compared to other sets you find in big box stores, the price of this one is good for how large it is. Find it as low as $64. See the comparison table for additional details. 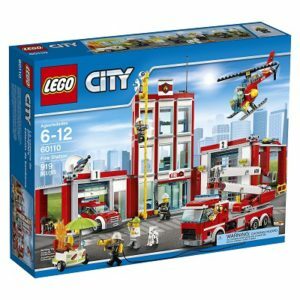 Key Parts 2 garages, firehouse, 3 floors, fire pole, fire chief's car, fire truck with cherry picker and helicopter, 4 male firefighters, female firefighter, hot dog stand guy, and a dog. 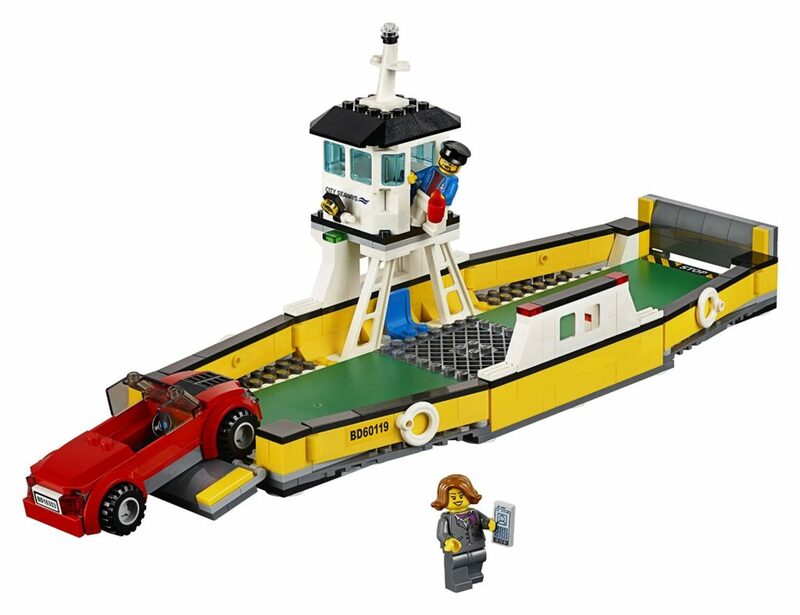 18.9"x14.9"x4.4" Ferry with gates, captains deck, car, mug, phone, 2 fire extinguishers, businessperson, and ferry boat captain. What’s harder than keeping all those Legos organized? What’s more is that many of the Lego sets are an actual investment that could be worth money over time. Losing even a single piece could drop the value of a set considerably. If you’re looking for something that’s customizable, I’d start with the stackable Blokpod storage bins. 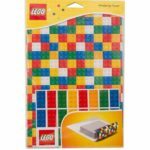 They’re cheaper than typical Lego storage and allow you to buy what you need individually. If you want something more portable, go with the Lego Bricks storage case from My Brick Bin. 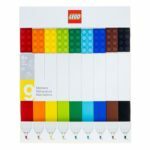 It has 17 individual compartments for various parts and is a great way to organize your bricks. Another really good option is just to use the hardware storage organizers you can typically find at the store. I use these for my screws in the garage and also have them for my excessively large selection of bricks. Here are a few other gift options you can check out. 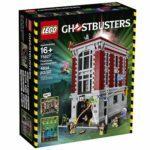 The Lego wrapping paper is perfect for your Lego gifts and the Ghostbusters Firehouse Headquarters is one of several large creator sets available from Lego. 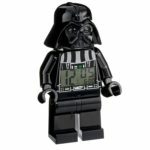 The Lego Star Wars Darth Vader mini-figure alarm clock is also available for Yoda, Boba Fett, and a Stormtrooper. While there aren’t any real alternatives to Legos, there are some other less expensive sets and brands that work well for kids. I typically use some good Lego alternatives for my youngest kids so I don’t have to worry about losing a piece. If you’re wanting something for your little children, that post is a good place to start.